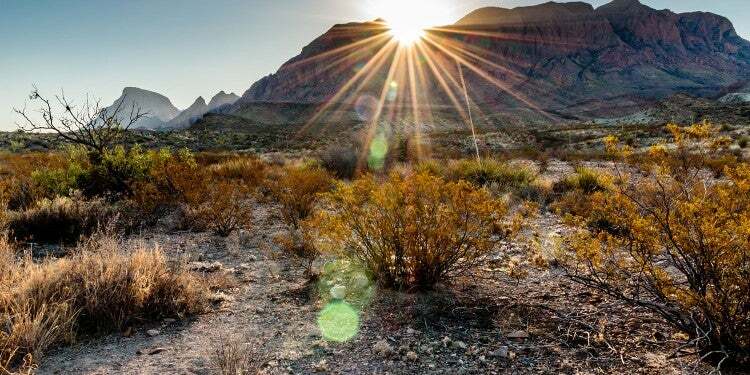 This guide to San Antonio camping was brought to you by Gregory, the maker of water reservoir backpacks designed to help you stay hydrated in hot environments while camping, hiking, and backpacking. Gregory packs assure safety and keep you equipped for your adventures while enjoying San Antonio’s green spaces. San Antonio might be best known for the Alamo, its missions, Tex-Mex, and the picturesque River Walk, but this south-central Texan city is so much more than one world heritage site. Believe it or not, there is some great camping nearby. The Alamo City has always had a special relationship with the great outdoors, even before Spanish colonists followed trails worn by buffalo and the local Payaya Indians to San Pedro Springs. In the early 1850s, Frederick Law Olmsted — the man whose landscape designs include such iconic green spaces as Central Park and Golden Gate Park — paid a visit to San Antonio. He was charmed by the live oaks and prairie grass, the local wildflowers like frijolito and horse chestnut, and the way the locals could gather to eat, drink, and play outside. 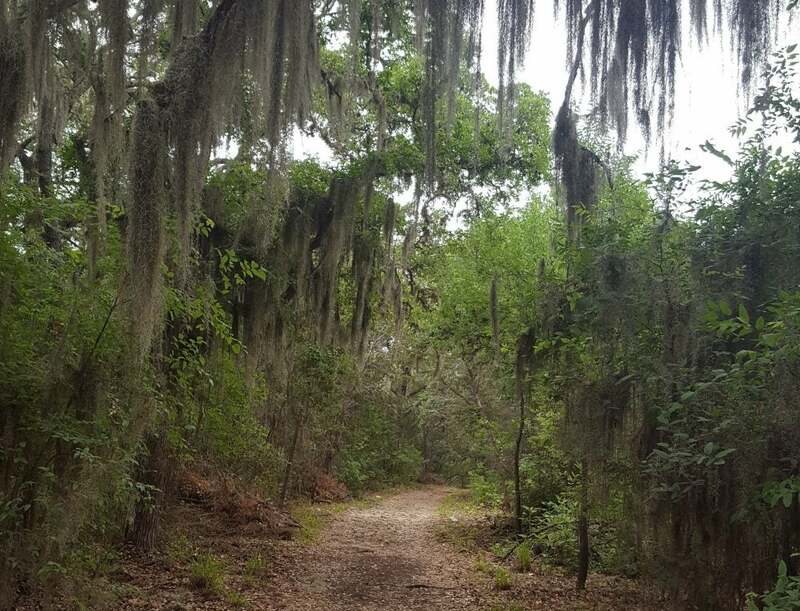 Photo from The Dyrt camper Emily M.
Today, San Antonio has more urban green spaces than ever, including hiking and jogging trails, a growing mountain bike scene, and even more state and national parks a short drive away. Whether you’re a local looking for a weekend getaway or a visitor hoping to get a deeper look at what makes Alamo City so special, there are lots of places to go camping within a convenient driving distance from downtown. Photo from The Dyrt camper Brian V.
From hidden caves to stunning overlooks to ancient dinosaur tracks, there are a lot of secrets to uncover in Government Canyon. 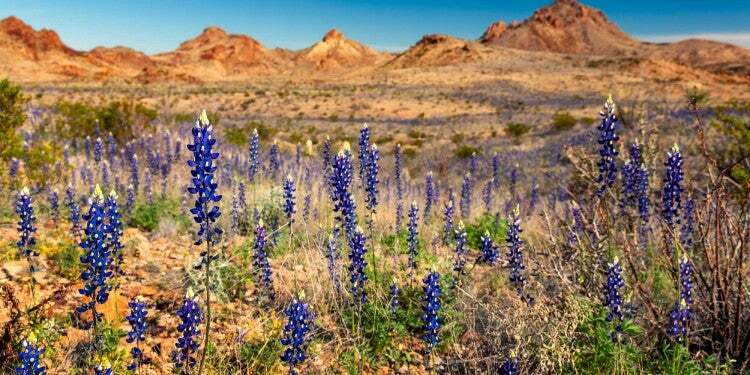 Just forty minutes from downtown, you can easily pop out for hikes like the Far Reaches Trail, but you’ll want to plan a little more carefully if you’re hoping to score some San Antonio camping spots. 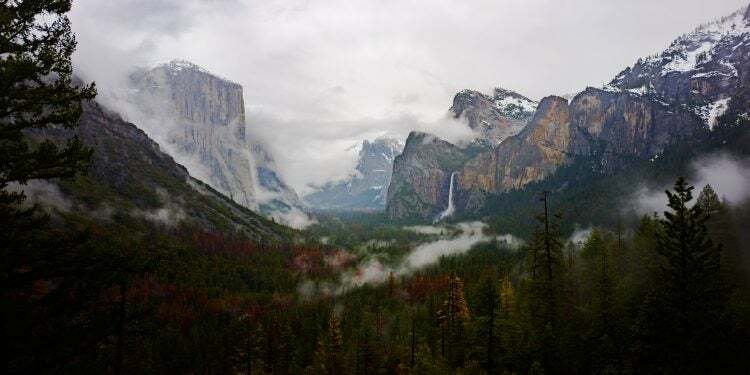 Government Canyon is only open to camping on Friday and Saturday nights, except for some holidays like Thanksgiving and for special events like wilderness survival clinics and night hikes. “The main attraction of this campground is hiking through the forest, exploring above or below the canyon, seeing the old 1880’s period Zizelman House and locating a few of the notable dinosaur tracks. There are a number of walk-in campsites with well-defined pad sites, campfire rings and a table. 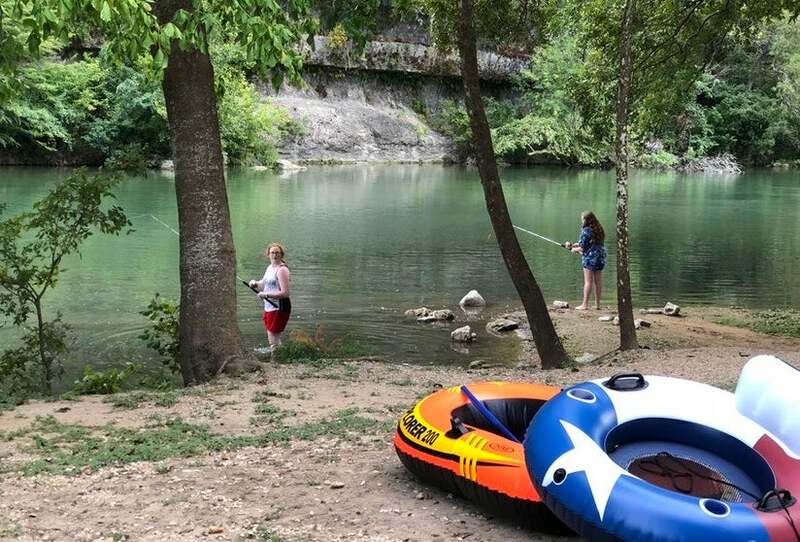 There are often burn bans in effect at this campground so come prepared with a gas stove.” –The Dyrt camper Troy W.
Photo from The Dyrt camper Matt M.
Popular with hikers, paddlers, and equestrians alike, Guadalupe River is a great place to cool off due north of San Antonio. There are 85 campsites with electricity and water and nine that are walk-in style. This isn’t a horse camp though, so riders need to limit themselves to daytime excursions. 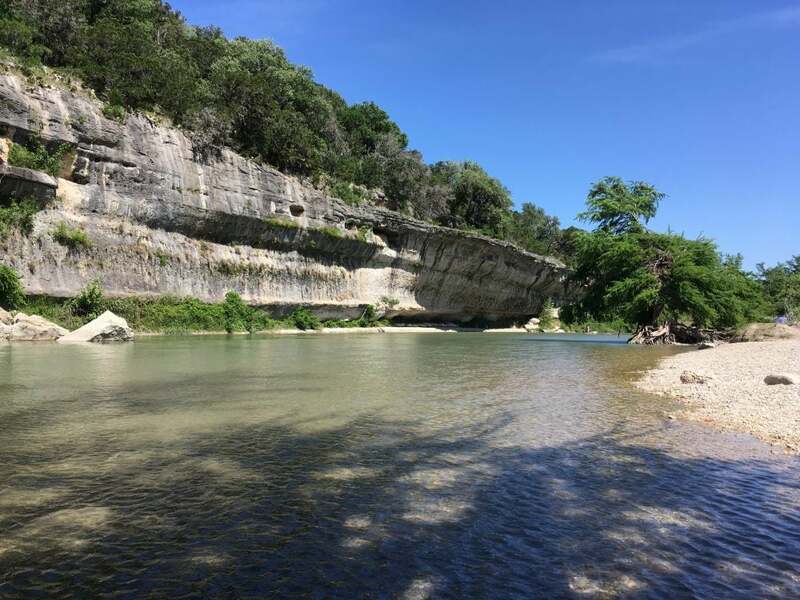 Guadalupe River State Park is also a stop on the Nichol’s Landing Paddling Trail, so if you’ve been curious about yakpacking, here’s your chance. 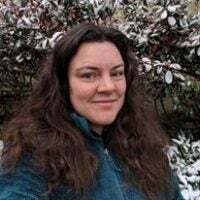 You can also have fun geocaching, viewing wildlife on the West Guadalupe Loop, and peeping for the rare golden-cheeked warbler amongst the park’s virgin Ashe juniper and bald cypress stands. “Trout fishing is great, swimming is too! We’ve kayaked this river at least 100 times in the last 5 years and each time we had lots of fun. Outside the park boundary, unfortunately, all of the land is privately owned so you can’t go out and explore on foot.” –The Dyrt camper Justin D.
Photo from The Dyrt camper JoAnn B.
Texans know better than most how to stay cool in any weather, and few methods are more fun than visiting swimming holes like the one at Blanco State Park. The pools were built by theCivilian Conservation Corps during the Great Depression, along with numerous other construction projects around the park. 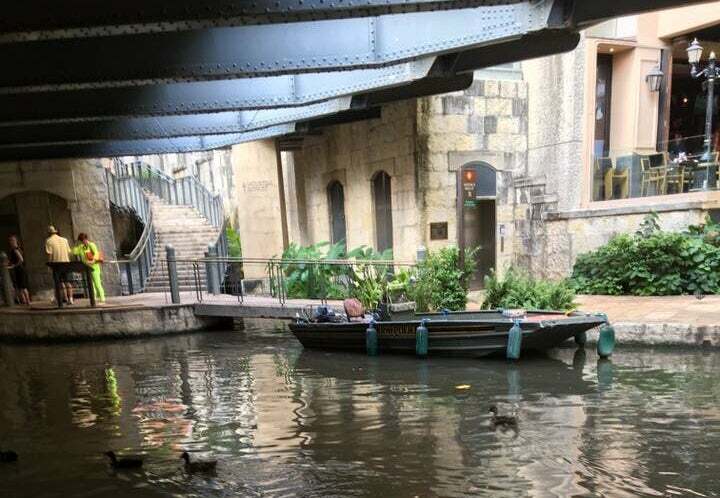 Meanwhile, an hour south back in San Antonio, the Works Progress Administration was busy developing the city’s famous River Walk for similar reasons—to introduce flood control to the region. Take advantage of all that hard work by going for a dip, or renting one of the tubes and kayaks the park has available. 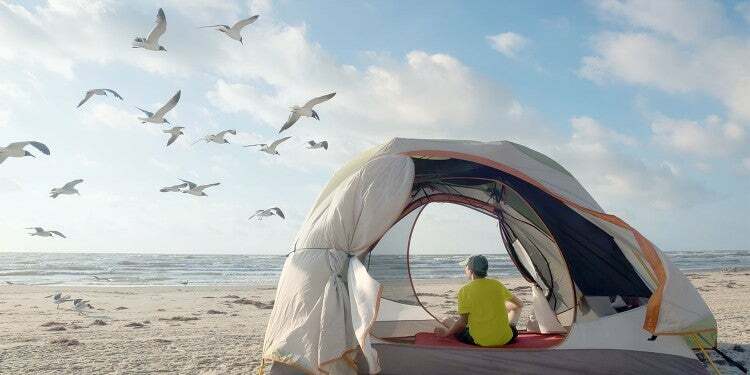 Afterwards, you can either cozy up at one of the dozens of tent sites that have water and electric hookups, or get a little fancy with your San Antonio camping at one of Blanco’s screened in shelters. They aren’t quite cabins, but they’ll keep the pests away. 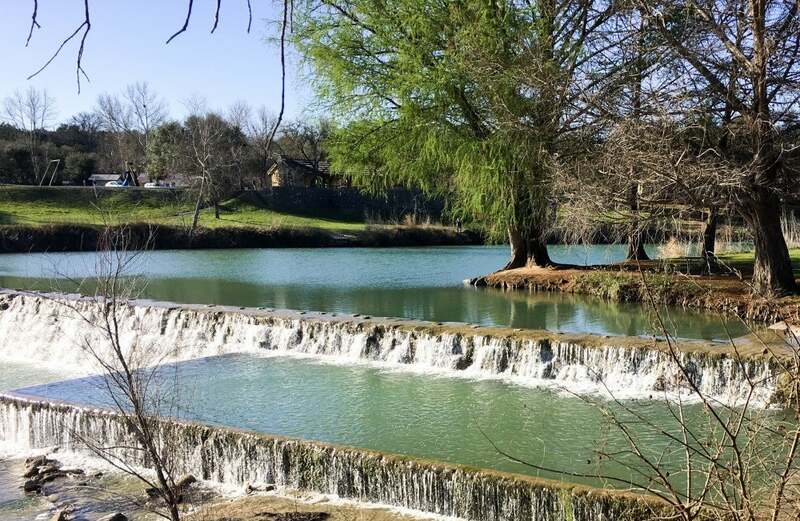 “This park is tucked in the middle of a beautiful hill country town of Blanco. 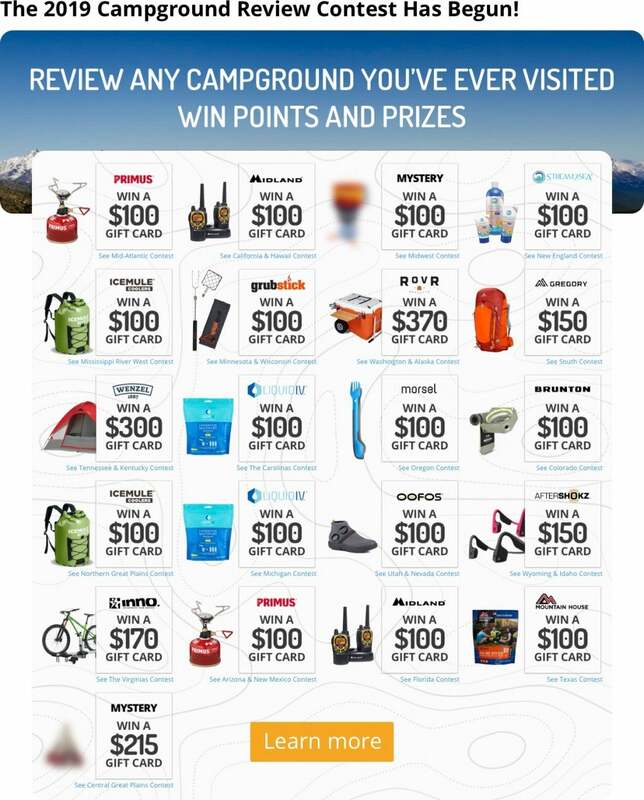 Great for camping or just a day trip. You can swim, fish, or just relax under the shade trees. While you’re there, visit the Redbud Cafe. 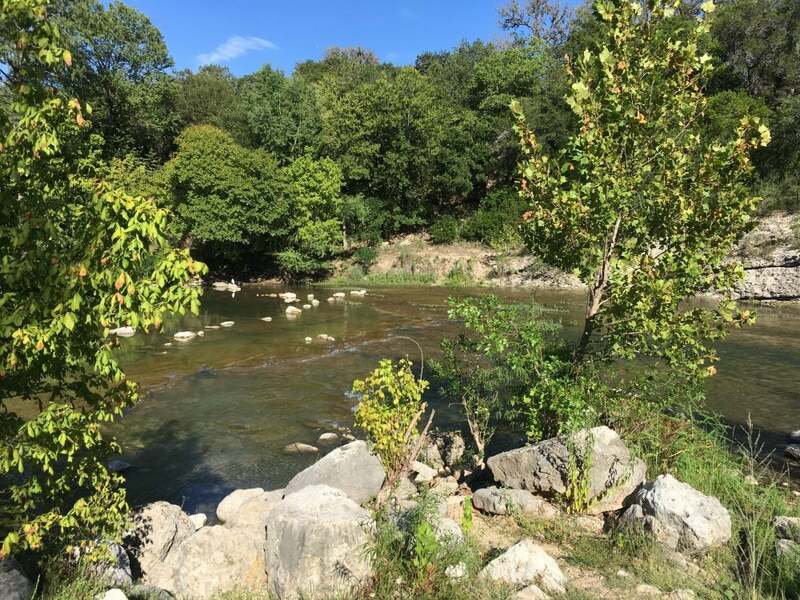 Their Blanco Burger is one of the best burgers you will eat.” –The Dyrt camper Gary F.
Photo from The Dyrt camper David R.
If you enjoyed the Guadalupe River in its own state park, you might like to see where it flows through Cranes Mill Park. Here the Guadalupe feeds into Canyon Lake, forming a great fishing and boating destination just an hour north of San Antonio. In addition to 30 RV sites and 34 tent sites, there are also two fishing piers, a marina, and a boat launch. “Cranes Mill has great trees for hammock camping as well as traditional campsites. There are all the normal amenities you’d expect and there is a lot of space for everyone to spread out. Definitely recommend the park!” –The Dyrt camper Matt M.
Photo from The Dyrt camper Mary A. 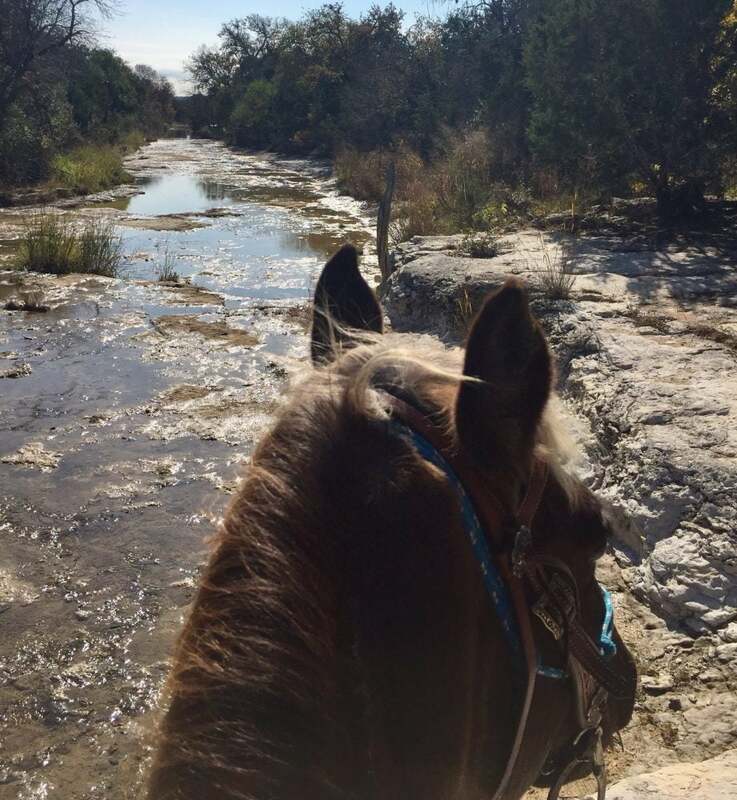 Another great spot for equestrians, Hill Country State Natural Area is chock full of trails for humans and horses alike. 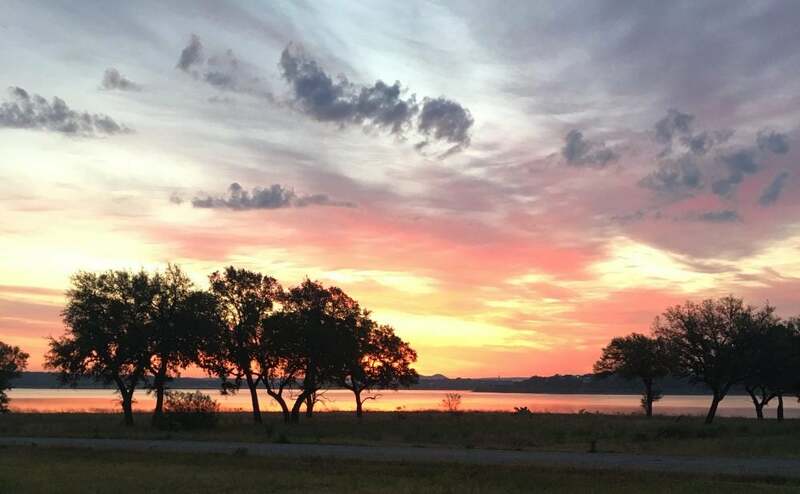 Unlike Guadalupe River State Park, Hill Country State Natural Area has amenities for horses to overnight, including well water, hitching posts and special parking near the designated equestrian area. The Bar O day use area has a water trough and hitching posts, and the Hill Country Trailhead Campground has six primitive equestrian sites. “Camping is primitive unless you rent the Lodge or Chapas group camping, but the scenery and trails are varied and it’s not far to town. 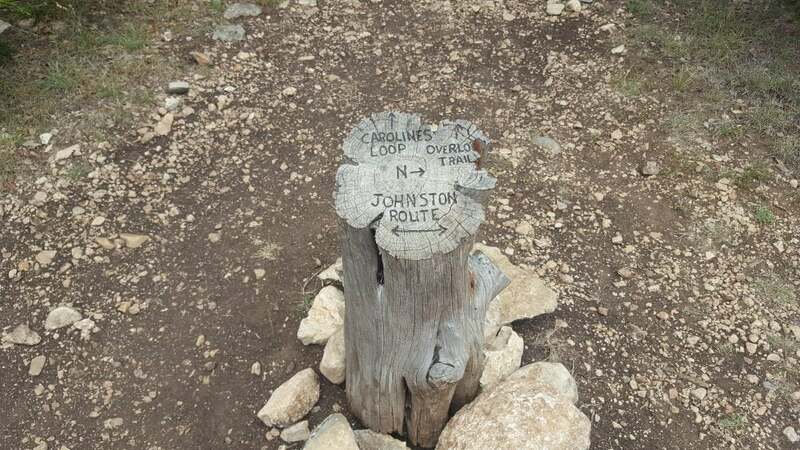 Some of the riding trails are quite challenging but there are plenty of moderate and easy trails to ride. Shoes or boots are recommended for horses due to the rocky terrain.” –The Dyrt camper Mary A. Photo from The Dyrt camper Jennifer M.
Close to the town of New Braunfels, where German settlers flocked in the 1840s after a long boat ride across the Atlantic and further wagon travel from Galveston up the Camino Royale. The Camino Royale, like the Natchez Trace, was an important old highway that connected the Deep South to all of Texas and on to Mexico City. Now the New Braunfels area underground limestone caves at Natural Bridge Caverns, the Schlitterbahn Water Park, and plenty of Texas Barbecue at classic joints loved by locals like Rudy’s or Cooper’s. Of course, it wouldn’t be San Antonio camping without floating on the Guadalupe River. The KI Ranch offers rental tubes, as well as floating coolers you can use to carry cans of Lone Star and Tecate through the water. If you’re feeling fancy, bring a six pack of Alamo Brewing Company beers with you. This San Antonio Brewery makes German-style lagers that will fit right in near New Braunfels. “The management was very friendly and helpful. They offer a taxi service up the river so that you can float back down and end right back at the camp. Floating times range from 1-5 hours. Absolutely no glass on the river and there are checkpoints!” –The Dyrt camper William C.
Photo from The Dyrt camper Carol-Anne E.
West of San Antonio in the heart of the Hill Country, the Boulderdash Cabin and RV Park is a simple, family-run operation with generously sized cabin and RV sites. Best of all, it’s close to Bandera—a little town outside of San Antonio that calls itself the “Cowboy Capital of the World.” Stop for a drink and a bite at the famous Cowboy Bar, “the biggest little bar” in Texas. 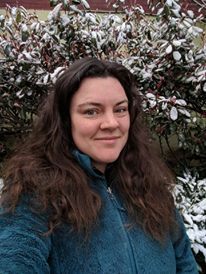 If you come at the right time of year, you can even participate in Cowboy Mardi Gras, when the whole town is taken over by cajun food, zydeco, and horses festooned with mardi gras beads. Camp closeby at Boulderdash and you won’t miss a minute of the dog costume contest or the epic parade floats. “This was a great location for spending some time on the Medina River and close to Medina Lake. we camped in the tent camping area above the cabin. it’s a bit of a steep walk from the campsite to the river, but not bad. 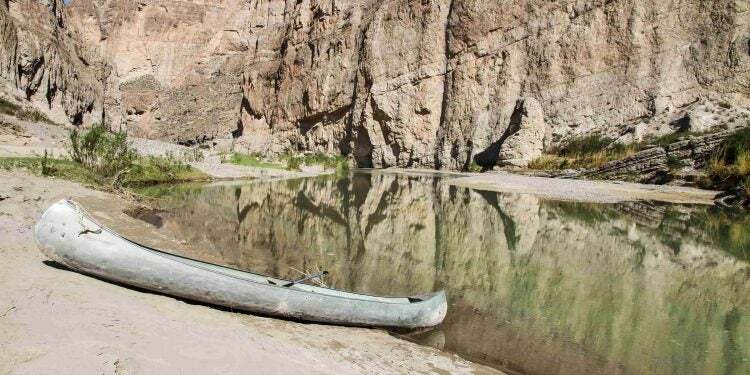 we were able to carry our kayak with no problem.” –The Dyrt camper Paige R.
Photo from The Dyrt camper Troy W.
For San Antonio camping with a side of fly fishing, head to Huaco Springs. The trout are huge and stocked by Trout Unlimited each year. As with many other campgrounds in the area, you can rent inner tubes, canoes, kayaks, SUPS, and rafts. Camping options include tent sites, RV sites, and cabins, with a little something for everyone. Close by is historic Gruene, Texas, a neighborhood in New Braunfels that is on the National Register of Historic Places, and which shares a name with Gruene Crossing, the southernmost public kayak takeout on the Guadalupe. Gruene was once a cotton country powerhouse before the boll weevil gutted the industry, and it still has that old school Texas flavor that’s hard to find. After a fun day of fishing and tubing, head into Gruene to explore the shops and sample some local wines at The Grapevine. “The office/store has an abundance of supplies from groceries to firewood to fishing supplies. The best part about this campground is the easy access to the river. 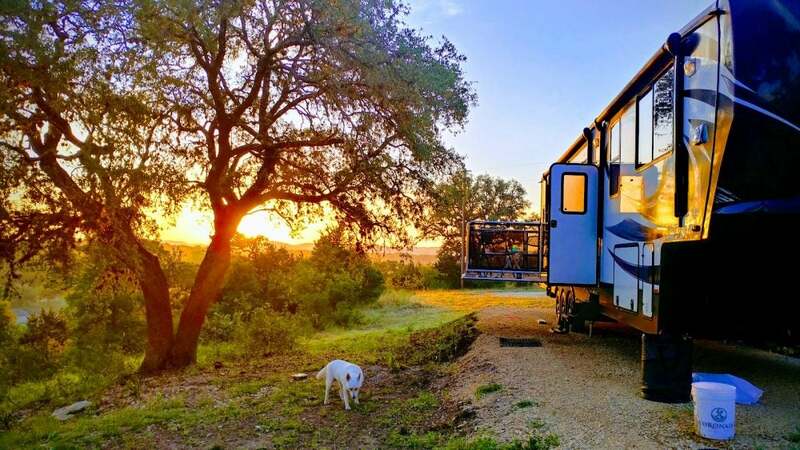 There are some campsites right on the bank of the river and others a short walk away under a grove of trees.” –The Dyrt camper Troy W.
Photo from The Dyrt camper Shelly S.
Now under new management, Alamo City RV Park is about as authentic as San Antonio camping can get, right in the heart of downtown. There is room for your big rig, however, with 90 foot “Texas Size” pull-throughs, as well as a dog park, and a community barbecue and smoker. There is a public transit stop right outside the park that will easily get you to the River Walk, Alamo, and popular greenways like the Salado Creek Trail. 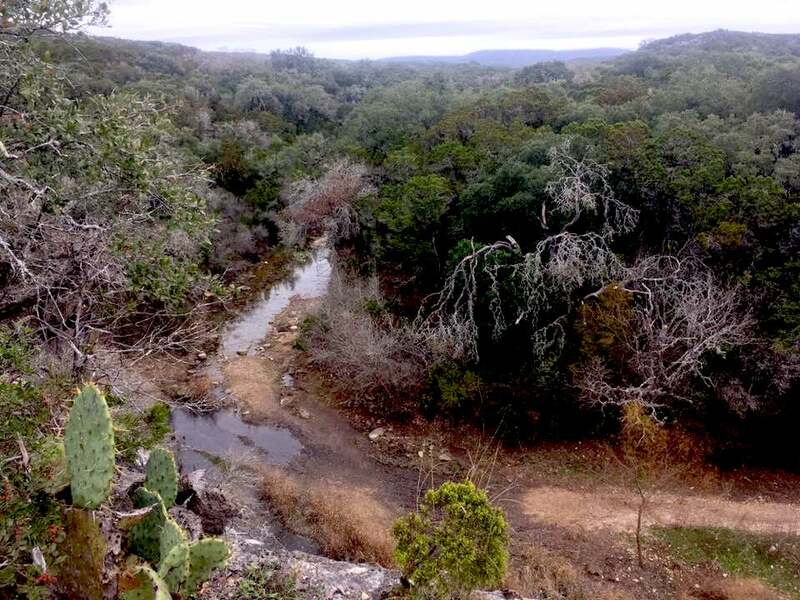 “I’m more of a woods-based camper with trails and water recreation, that being said there is a lot within walking distance of this campground, there is wildlife, boats to ride in and you could consider it an urban forest.” –The Dyrt camper Shelley S.
Mountain bikers love the rolling hills around San Antonio and for good reason. There are lots of trails to explore at varying difficulty levels throughout the metro area. In 1993, South Texas Off Road Mountain-Bikers (STORM) formed to celebrate all that sweet Texan single track, and to keep the MTB scene as green as possible. These days, one of the places STORM members and other area mountain biking enthusiasts like to head is Medina Lake, which is part of the Howard Peak Greenway system. Medina Lake is home to fun switchbacks and other technical terrain that will get your adrenaline pumpkin. Afterwards, you can rest up at Medina Lake RV Park. This friendly oasis is a wildlife-viewers paradise, with resident deer that have little fear of humans. Grab a bite at their Top of the Trail Café on the weekends, or join your fellow campers for a Friday Night Weenie Roast! “Easy to access, even for larger rigs. We stayed in 39 foot 5th wheel. Plenty of pull thru spots, full hookups, regularly spaced bathroom/showers. Nice store for basic needs, nice laundry room. Great CG to view wildlife. 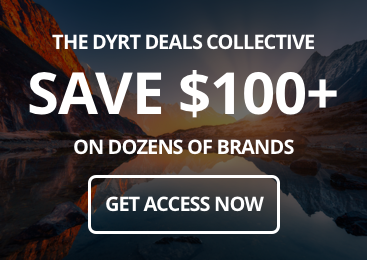 Deer will literally eat feed out of your hands.” –The Dyrt camper Steve R.